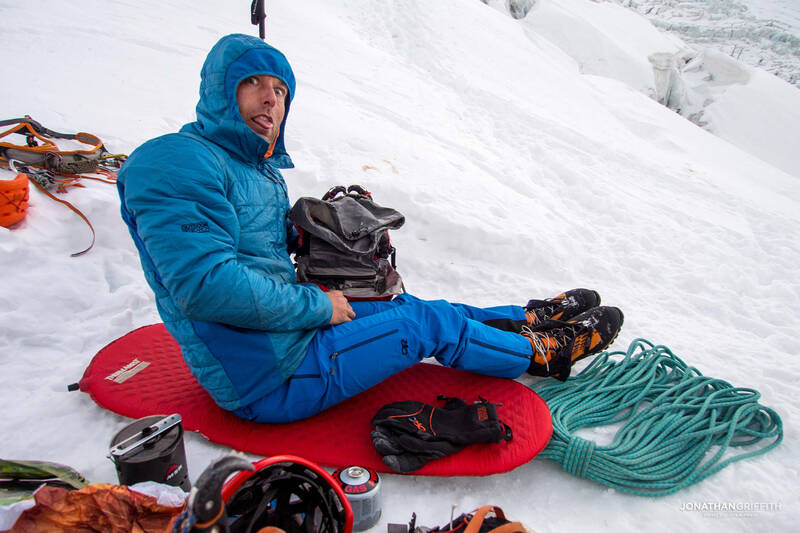 “It’s the best ice route on the face” Julien Desecures had told me, grinning ear to ear as his mind drifted off to a happy place many years ago. We were just traversing under the north side of the mountain and had a prime view of the whole gully. It looked in excellent condition, rare for this route, and as he talked me through the delicate 5 star climbing I felt an old itch come back to life. 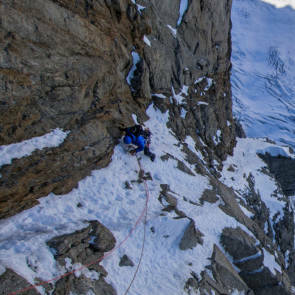 The Japanese Route on the Grandes Jorasses is a route that both scared and fascinated me ever since I first stepped foot on the Colton Macintyre 5 years previously and felt, through the darkness, the presence of this huge menacing feature above us. 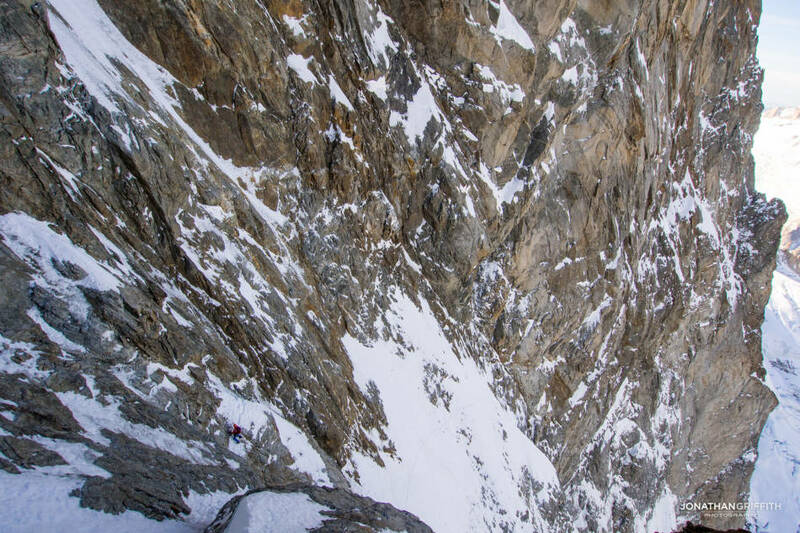 What always drew me to the Japanese route was how impressively direct it was; a dark narrow gash perfectly bisecting one of the most famous alpine faces in the world. 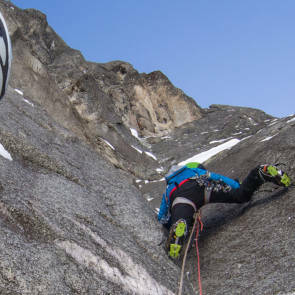 It’s a rarely visited climb on this austere face, menacingly capped by a huge overhanging cornice that every so often collapses and takes out everything beneath it. I walked beneath the face a few more times that autumn, always glancing up at the narrow confines of the route but always finding an excuse to do a different one. 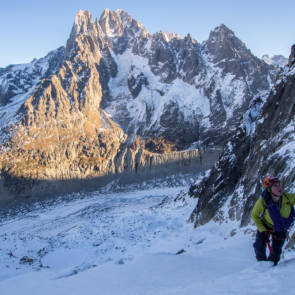 Nevertheless I’d also managed to get Euro MOG to agree to get on the Grandes Jorasses and after an autumn ticking off a long awaited tick list of routes, it was time to turn my attention to this last one. I knew that I wouldn’t get conditions like this on the route for years to come. The motivation was low. 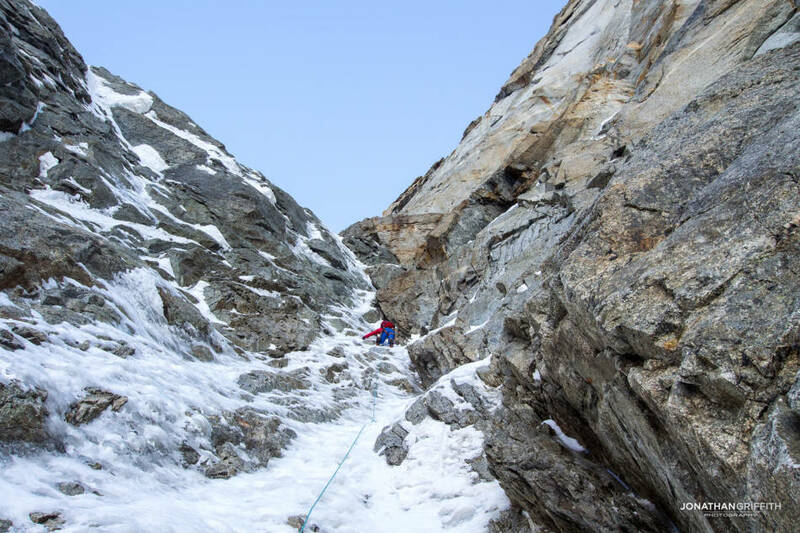 I had only just arrived home from climbing the Polish Route on the Jorasses a few hours earlier and finding a reasonable list of excuses for why we shouldn’t head back up immediately was relatively easy. The weather window was too tight, there would be people on the upper part of the route, it might be better in a week’s time. 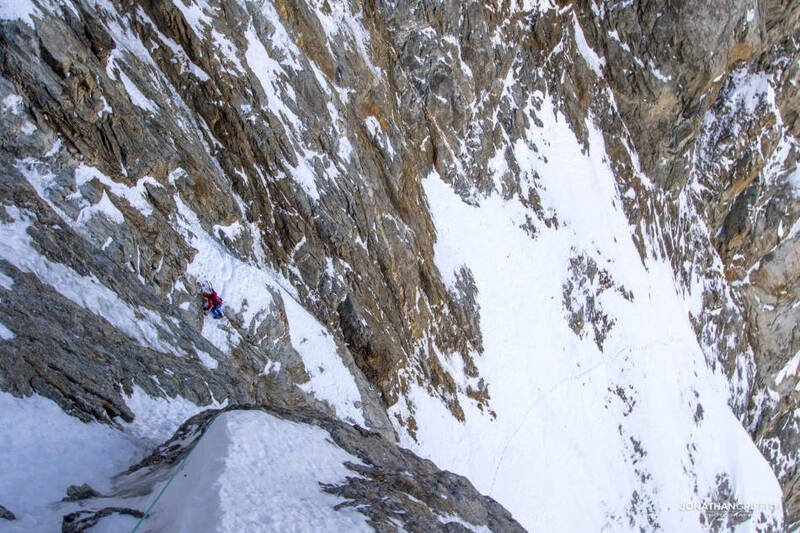 There is always a decent excuse when you want one in the Alpine world, masking the reality of the situation which always boils down to: I can’t be arsed. It turned to Adam’s wife Caroline to man us both up, make us pack, and head out of the front door the following morning. Adam tacitly agreed to carry the heavier pack as we started the long trudge up to the base of the Jorasses, my fifth and final one of the season. However if there’s one thing that is always guaranteed about heading in to the hills with Adam is that we’re going to have a good time. Settling in for a bivy at the base I felt pretty tired, I was looking forward to the next day and I think part of me was relived that I wasn’t going to have to come back to this face this season- the first signs of winter had just arrived with a dip in temperatures and a heavy snow fall in the next couple of days. 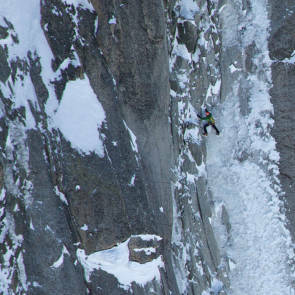 The Jorasses would close its doors after one of the most popular seasons on its face in history. 4 am: I love waking up beneath the Jorasses. Watching the headlights of keen climbers already high up on the face, and the always brilliantly clear night sky above. There was a time when a morning bivy was a horror show that couldn’t be avoided, but I like the morning ritual now, maybe I’m getting old. 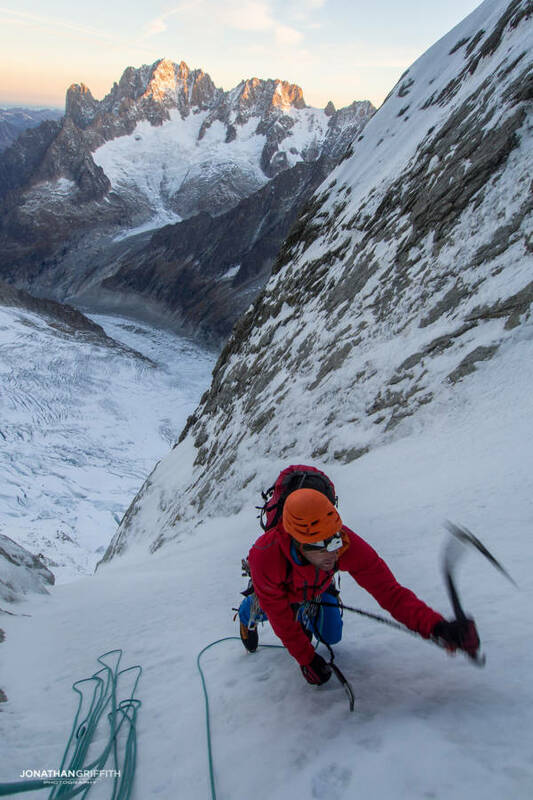 The familiar bobbing of the head torch and rhythmic thunk thunk of axes and crampons ensued as we simul climbed our way up the central ice field and in to the Japanese Couloir high above. The calves complained about being back on the face again but we were making fast progress. 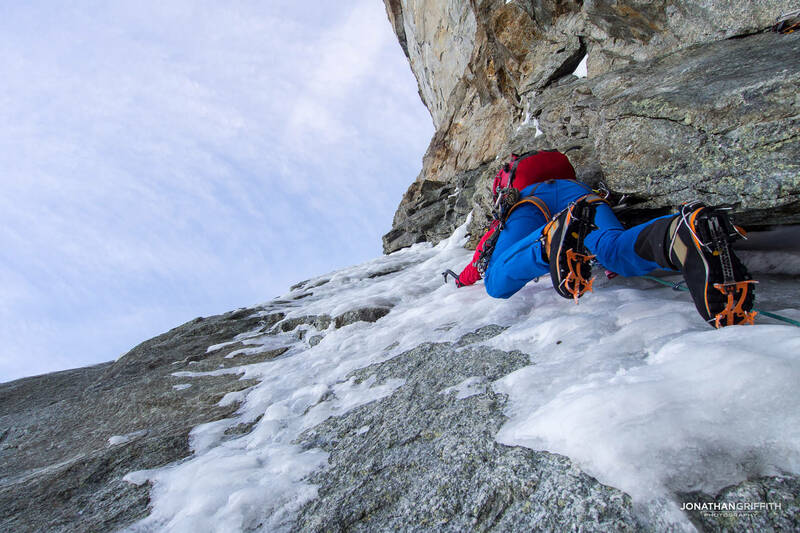 As dawn broke we found ourselves at the base of the first difficult pitch. 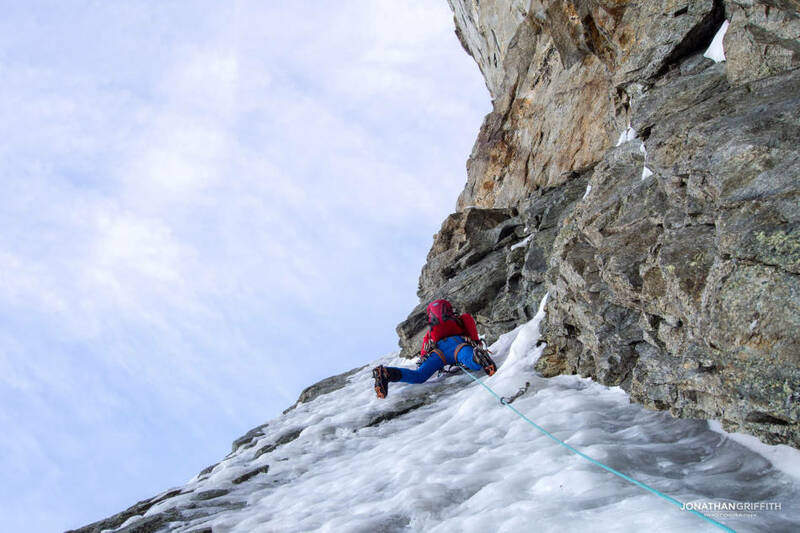 Ice has a habit of making a mockery of grades and we found ourselves simul climbing up what should have been delicate 90 degree ice, but was in fact the easy nevée that Chamonix is so famous for. Above reared the meat of the climb, a series of steep corners that would be desperately hard if it wasn’t for the thin smearing of placage ice that had gradually built up layer upon layer from the wet weather during the summer. 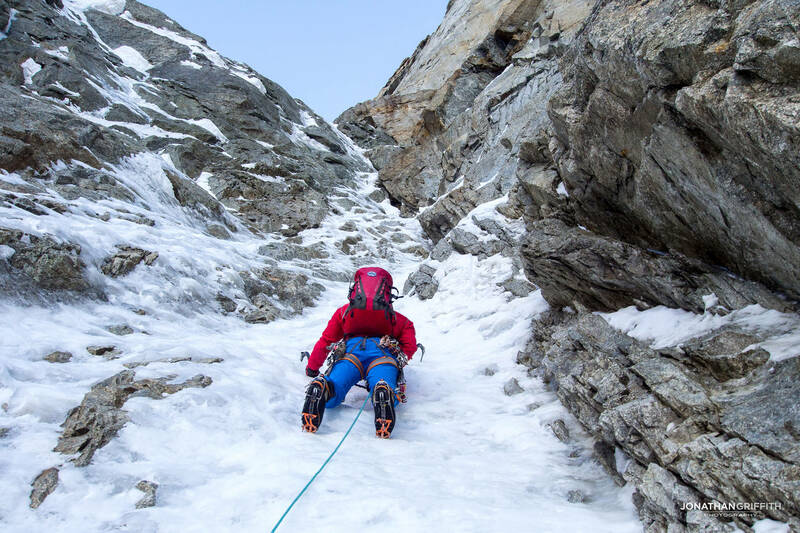 As I seconded Adam up these ice pitches I actually found myself having the most fun I’ve ever had on the Jorasses. The ice was the exact perfect mix of steep, thin, but bomber placements. Thin hooks in squeaky ice all the way up and out- I thought back to Julien’s words and understood what he was talking about now. 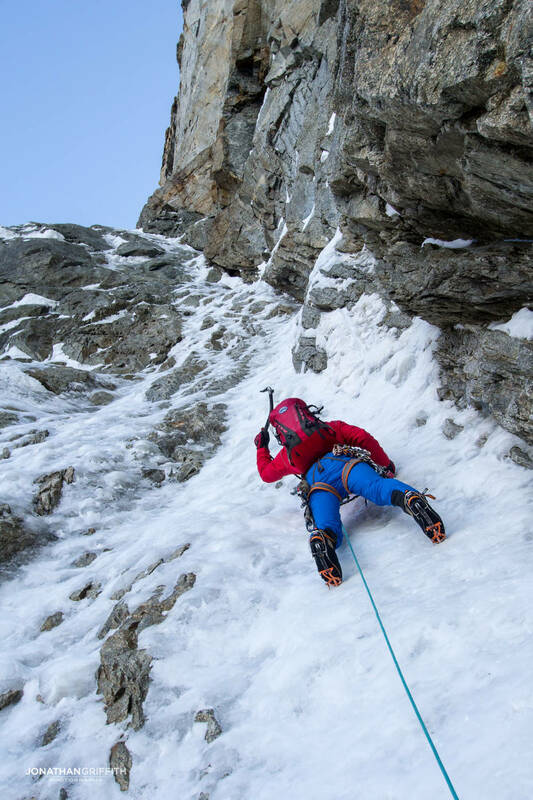 The Jorasses is one of the finest North Faces in the world because it can provide pretty much any kind of alpine experience, from scary multi day winter climbs to fast and light plastic-ice autumn hits, and everything in between. 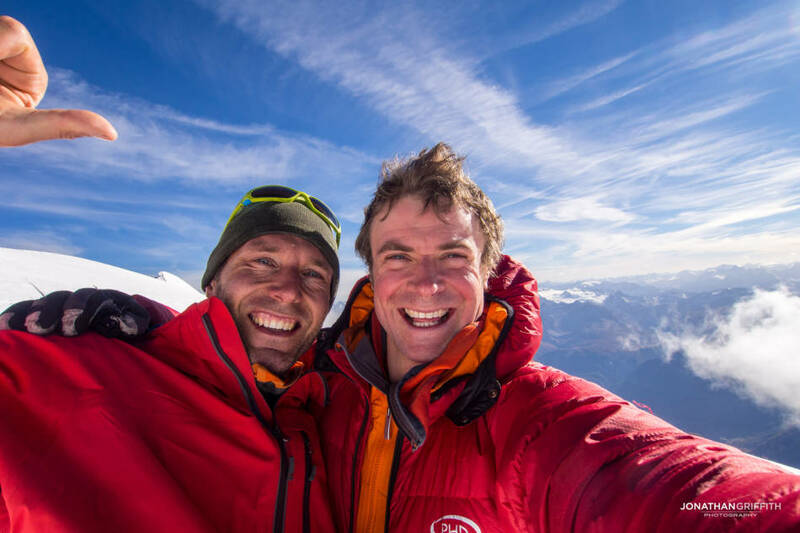 Here I was ending my season with a close friend, grinning like a kid, not a care in the world, as if we were cragging down the valley. Electing to simul climb as much of the route as possible, given the amazing ice conditions, the once perceived intimidating confines of this line melted away and we traversed over to join the top of the Colton Macintyre, on to the Walker Spur, and the main summit itself. 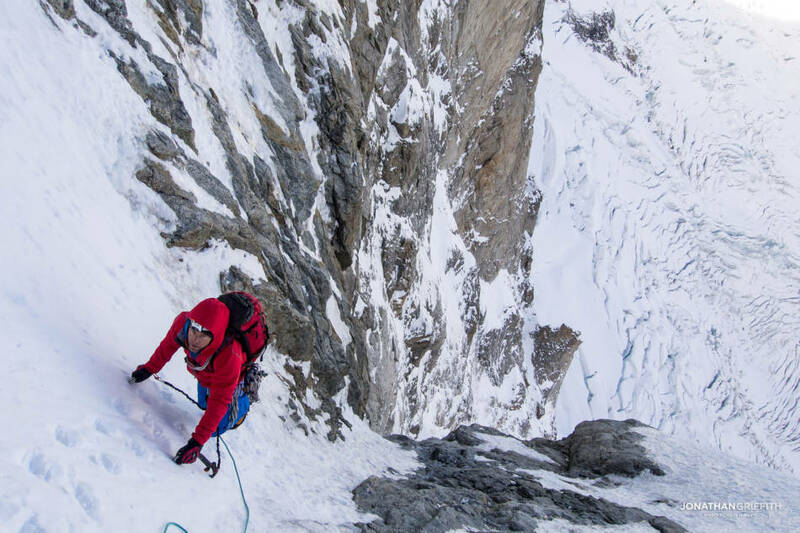 It’s always a treat topping out with plenty of day light left, leaving the cold confines of the North Face and taking in the heat of the sun, watching the rest of the Mont Blanc massif sprawl out all around you. Sitting on the summit with Adam, laughing about stuff that probably really wasn’t funny, I had to say I was glad that his wife had been the manliest of us all and forced us back on this face one last time this year.